My retelling of the Punjabi Folktale Mirza Sahiban, previously posted to the Non Stop Bhangra blog. During the time of the Emperor Akbar the Great, in the land between the rivers of Ravi and Chenab (now part of Pakistan), there were two villages, Khewa and Danabad. Mahni Khan was the chief of Khewa, and also of his clan, the Sayyal. Sahiban was his daughter. Fateh Bibi, Mahni’s “milk sister” (they were both nursed by Bibi’s mother as babies, because Mahni’s mother had died; and so they were considered siblings), lived in Danabad, where she had married into the Kharral clan. Fateh Bibi’s son was Mirza. This was originally posted to the Non Stop Bhangra blog, in celebration of Lohri, the Punjabi winter solstice festival. Ever wonder where the customs of Lohri – the bonfire, the singing and dancing, the sweets — come from? There are many different stories, and here’s one: the story of Dulla Bhatti. My retelling of a woman-positive fairy tale from Punjab, originally posted at the Dholrhythms blog. 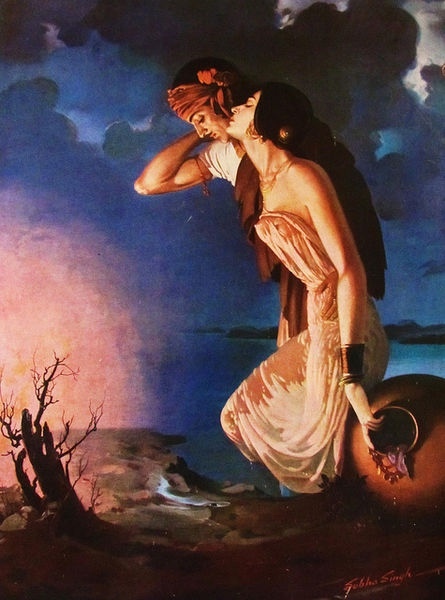 My retelling of Sohni Mahiwal, originally posted at the Dholrhythms blog. Once upon a time, on the banks of the river Chenab, near the city of Gujrat, lived a potter named Tulla. Tulla’a pottery was famous, and in demand all through Punjab, and even in lands beyond. Tulla had a daughter who was so lovely that he and his wife named her Sohni (“Beautiful”). Since Sohni grew up in her father’s shop, she learned how to decorate the pitchers and pots that came off his wheel with beautiful designs: flowers and elaborate patterns. And so the family flourished.